Powers/Abilities: Like all gargoyles Demona's strength is superhuman. She has wings that allow her glide, not fly, on the wind. Because of a magical pact with MacBeth, not only does she not age, but she can only be slain by him. Demona is a powerful sorceress, trained by her later enemy the Archmage. With the assistance of Xanatos, she has been able to caste a spell that turned all of New York to stone. Unlike most gargoyles, she does not turn to stone during the day - instead she becomes human. However, she has the same recuperative abilities. History: Demona was born (or rather hatched) at Castle Wyvern in Scotland during the 10th century. Like all gargoyles, she was subject to fear, distrust and even outright hatred by the humans that lived in the castle. Unlike most of the gargoyles, she returned these feelings. During her youth, she became an apprentice to the Archmage, the castle's resident sorcerer. The Archmage was an abusive teacher, degrading her and using her to do his dirty work. Still, she learned the art of sorcery well. Around this time, she fell in love with the gargoyle the humans had named Goliath. Eventually, the Archmage was banished from the castle. In retribution, he poisoned its lord. The leader of the gargoyle clan, who would later be known Hudson, led Goliath and Demona in pursuit of the Archmage. During this time, Demona tried to get Goliath to assume leadership of the clan. Having too much respect for Hudson, Goliath refused. During the battle with Archmage however, Hudson was wounded and he decided to step down in favour of Goliath. 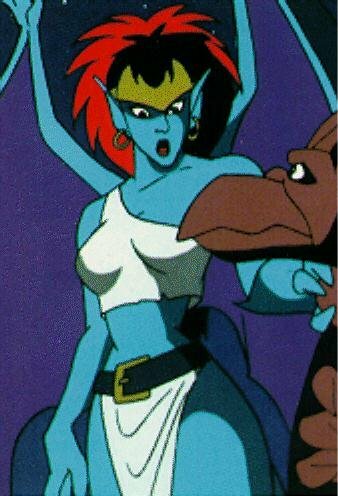 With Goliath in charge, Demona became second in command. She continued to nurse hatred toward the humans. When Vikings attacked the castle, she made a pact with the castle's captain of the guard to betray it to the marauders. In return, the gargoyles would be allowed to live in the castle. Things did not work out. Most of the gargoyles were slain and Goliath and the rest of the survivors were frozen in stone by a spell. Demona survived and soon took control of a small group of gargoyles. During this time while stealing food, she wounded a peasant boy slashing his face. The boy would grow to assume the title of the Hunter. Desiring revenge, he led a crusade against all the gargoyles in Scotland, killing many and battling with her many times. Demona grew old. She realized that she needed to be young to continue her fight. For reasons of their own, a group of witches known as the Weird Sisters introduced her to a mortal named Macbeth who had been falsely accused of trying to usurp the thrown of Scotland. This was the Macbeth that Shakespeare would later write about. They made an alliance. More than that, they underwent a spell that returned Demona to her physical prime and aged Macbeth slightly. Together they overcame the forces of King Duncan and slew the Hunter who had killed Macbeth's father. The Hunter had a son who would later replace him. 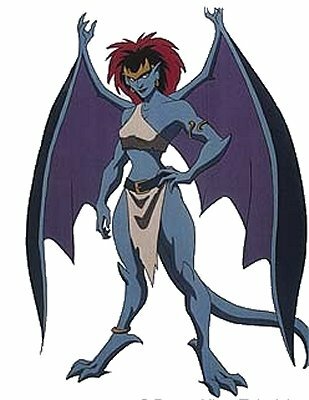 Macbeth was the one who gave her the name of Demona (gargoyles traditionally do not have names) due to her ferocity on the battlefield. Macbeth replaced Duncan and ruled Scotland with her at his side for twenty years with neither of them aging. Duncan's son, along with the King of England, made war with Scotland. Mistakenly believing that Macbeth had betrayed her, she abandoned him and a made a pact with the English. Macbeth was defeated, but Demona was betrayed and her gargoyle followers were slain. Demona soon discover that she and Macbeth were immortal. The only way they could die was if one killed the other. For the centuries that followed, she was hunted by both Macbeth and the descendents of the original Hunter. In the late 20th century, she made a pact with the billionaire industrialist David Xanatos. With his resources, the Castle Wyvern was brought to New York and built into a skyscraper. This broke the spell that had turned Goliath and the rest of the clan to stone. Goliath eventually discovered the truth about her and a battle resulted in which Goliath and his clan prevailed. She soon found herself opposed by the last survivors of her race. Comments: Voiced by Marina Sirtis. Profile by Matthew Ilseman. Matthew notes that "This is not the complete story, but I will not summarize the rest the series because it would take to much time and I'd rather not give away many of surprises. There is more information in the other profiles. The best site about the show is at www.gargoyles-fans.org, it has character profiles and summaries of the episode." Thanks to Anna Raven for correcting her first appearance information.